My creation for dinner Saturday night. A bag of frozen cooked shrimp, a few zucchini, some fresh herbs, and items that are always in the house gave birth to deliciousness. 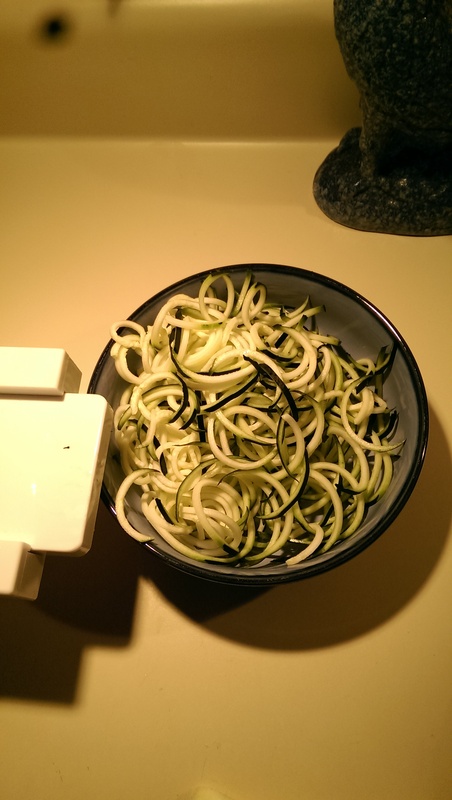 As I mentioned in my post for Creamy Zucchini Noodles, I love my spiral slicer. 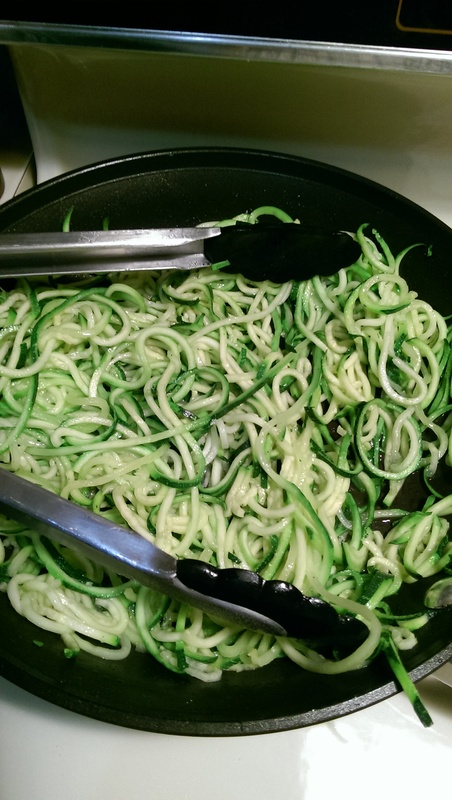 We love zucchini noodles and they are a healthy alternative to pasta for whole food and grain-free diets. 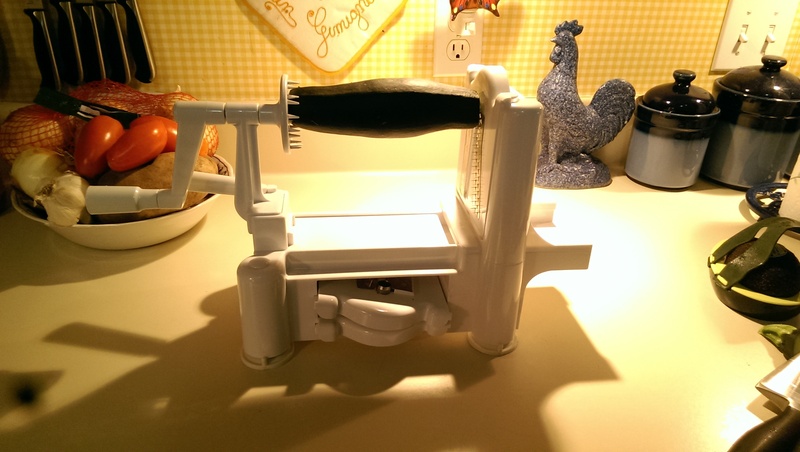 So I made some noodles. 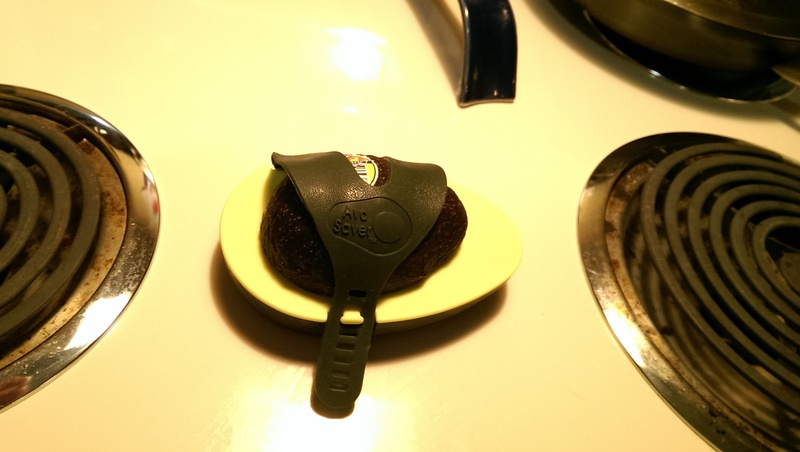 I took this next picture to share with you another of my favorite kitchen tools, the Microplane grater. 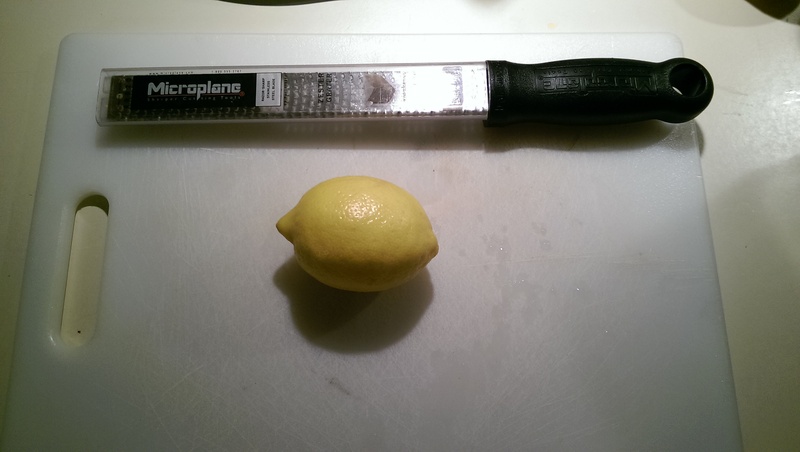 I zested the whole lemon before squeezing all the juice, using both for the sauce. 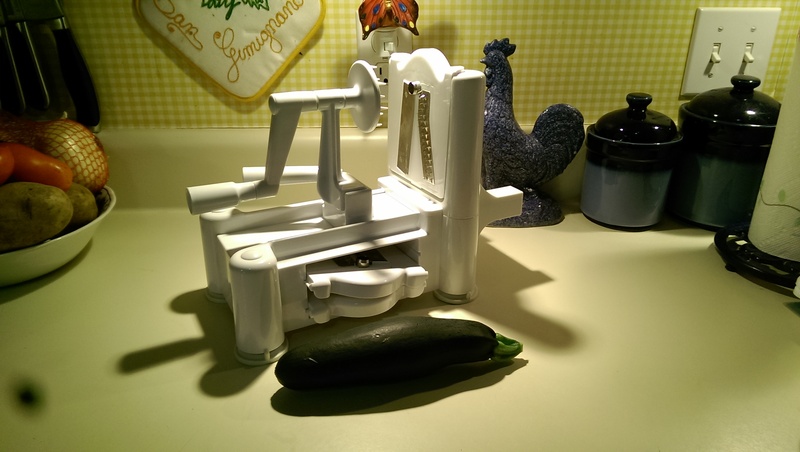 Aside from making the noodles and handling the lemon, the only prep that was needed was getting the garlic ready for the mincer. 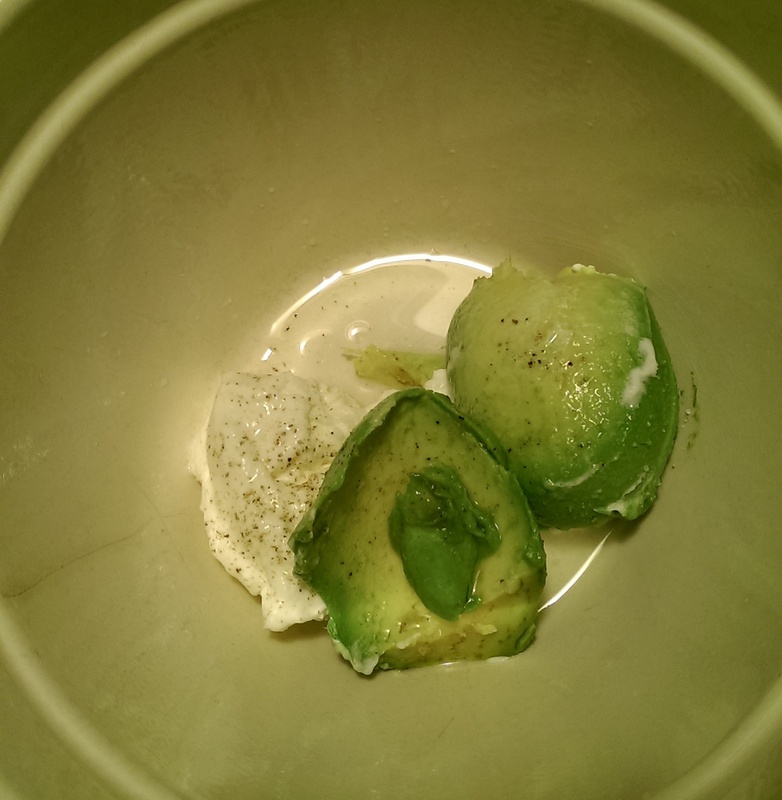 My favorite kind of meals are ones that are fast, cheap, and easy. This one checks all of those boxes. As usual, I tossed the noodles in olive oil that was preheated in a skillet over medium heat. I shook some salt and fresh ground pepper over it and cooked them for about 5 minutes until they softened, but were still a little firm. 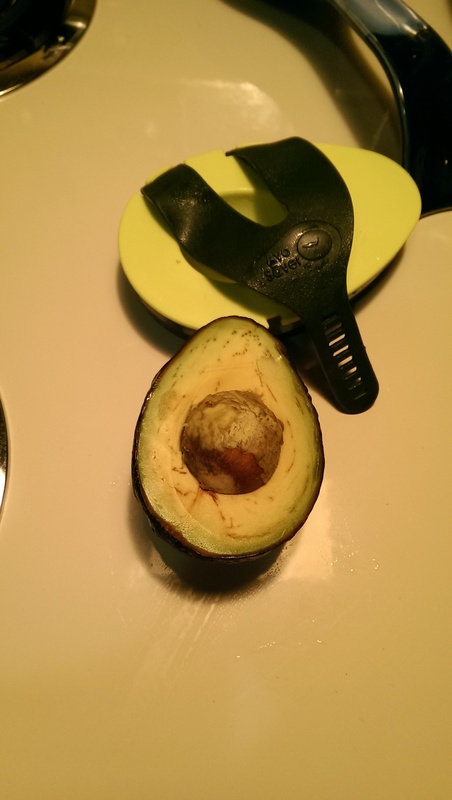 I removed the pan from the burner and set it aside. Then it was time for the sauce. I melted 4 tablespoons of butter (I use Kerrygold) over medium-low heat and then added 6 cloves of freshly minced garlic, cooking for about 2 minutes. 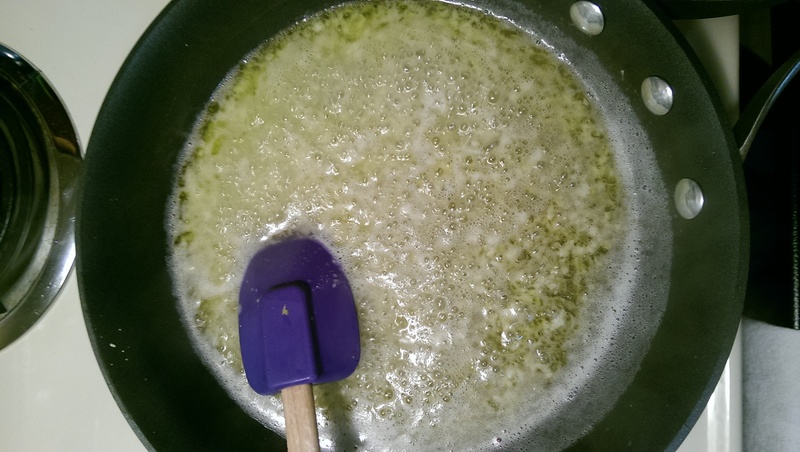 Then I added 1/4 cup of white wine, the lemon juice, and zest, bringing it to a boil. After about a minute or two of boiling, I added the thawed shrimp. I heated the shrimp in the sauce over medium until they were heated through. (You can tell when they are heated enough when they have shrunk a little and the sauce starts to boil again.) 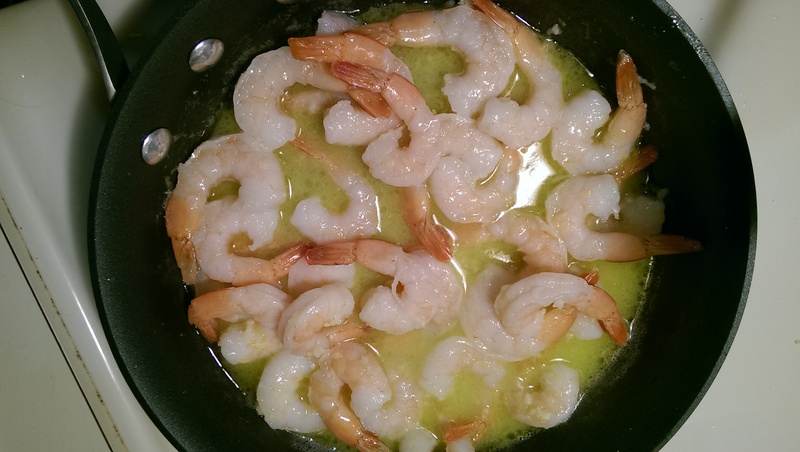 I removed the shrimp from the pan with a slotted spoon and set them aside. 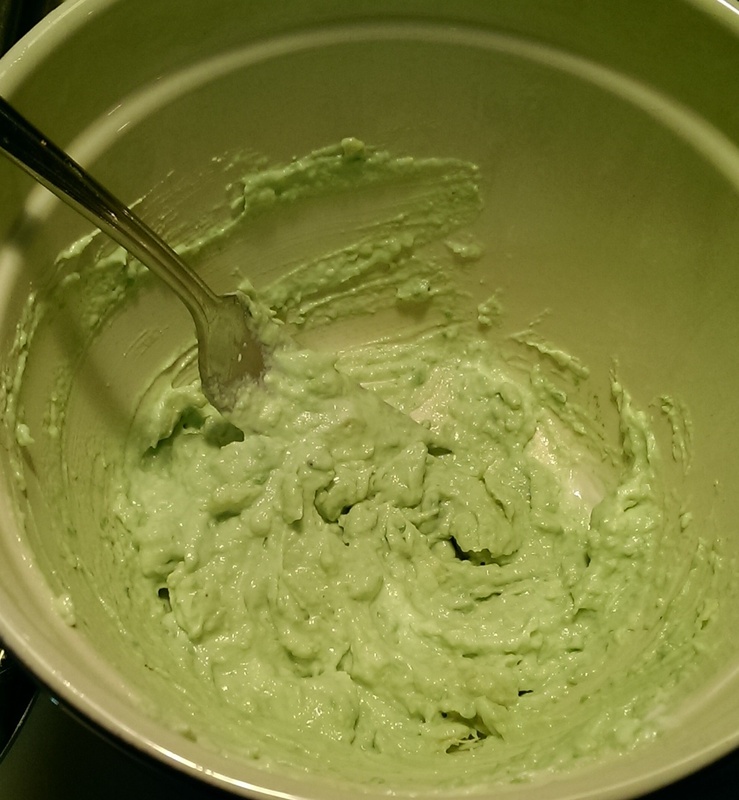 Then I added a tablespoon of gluten-free flour (Bob’s Red Mill), whisking constantly to combine. I also added a little salt and fresh pepper after the flour. 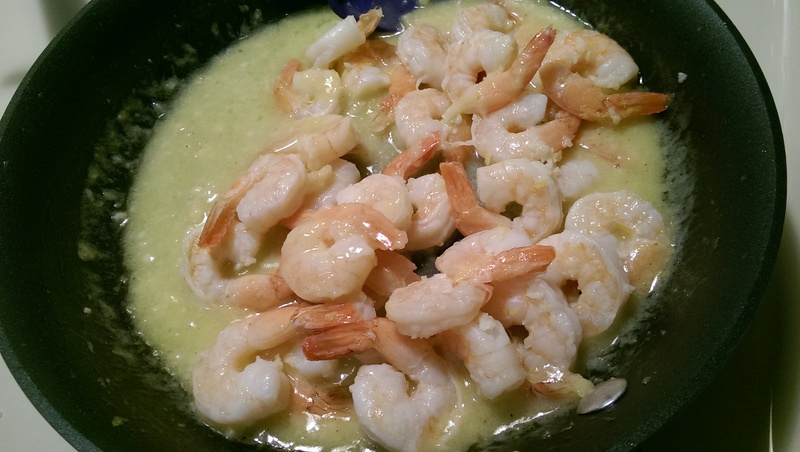 Once the sauce had thickened, I returned the shrimp to the pan and coated them in the buttery lemon sauce. 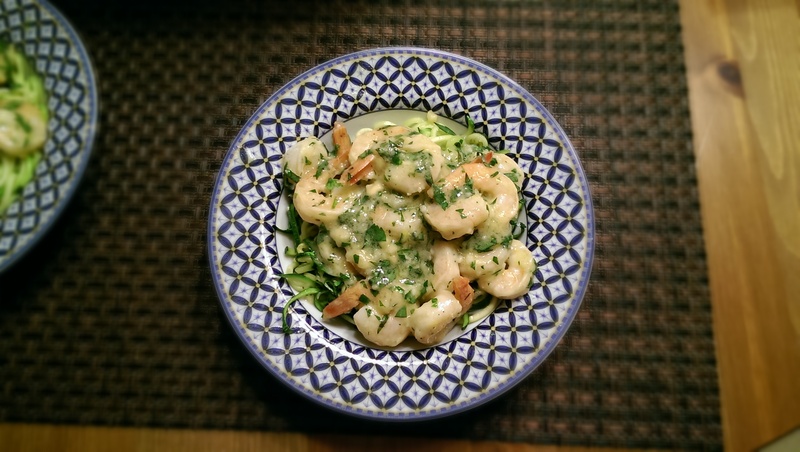 I threw in about 2 tablespoons each of freshly chopped parsley and basil from the garden, tossing well to coat the shrimp. 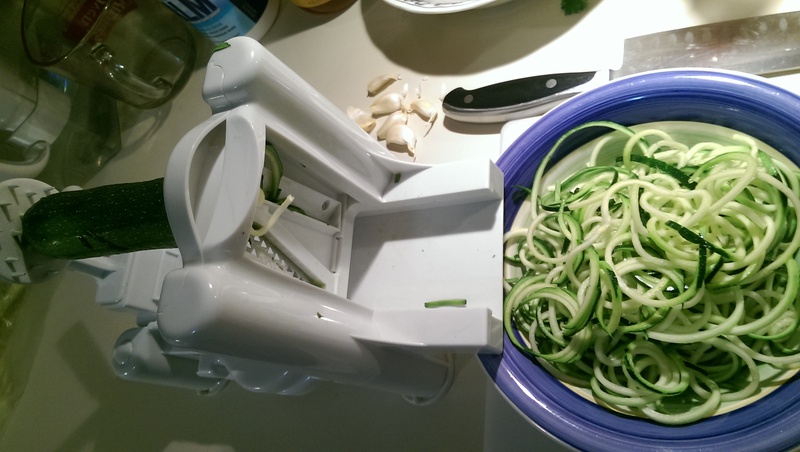 I divided the zucchini noodles into our bowls and topped them with the Lemony Shrimp Scampi. Oh. my. It was so good that this is the fastest turnaround for a recipe post from me. Ever. The amount of shrimp should probably be for three servings, but I only had two servings of noodles (portion size is not something the Russian and I do well), so I would suggest that you add another zucchini to the noodles if you don’t want to eat 6 ounces of shrimp in one meal. 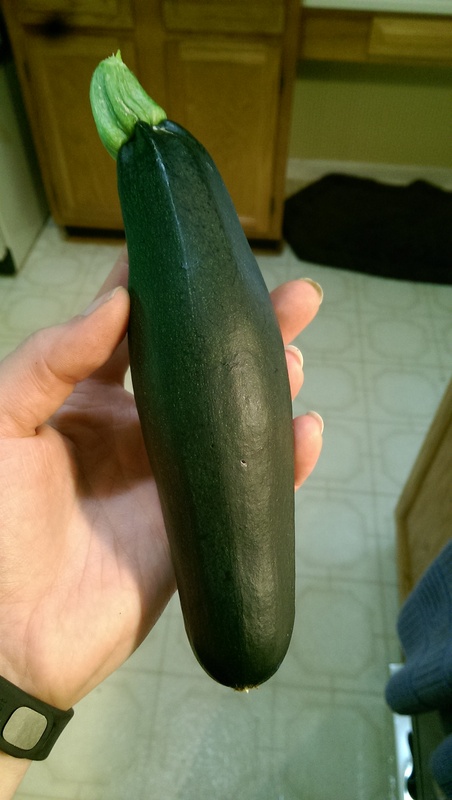 Another thought that I had was it may not be easy to find a 12 ounce package of shrimp, so if you can only find a 16 ounce one, use two additional zucchini and increase all the sauce ingredients slightly. If you are friend of mine, you can probably eat the portions that this recipe makes – perfect for two! Heat EVOO in a skillet over medium heat. 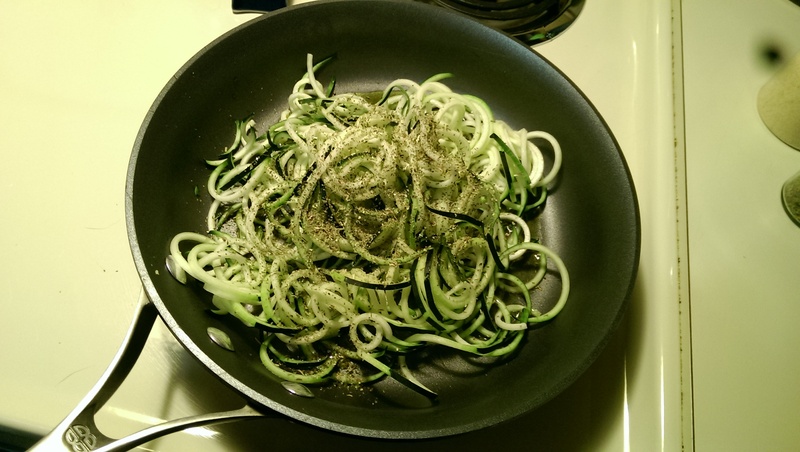 Add zucchini, salt, and pepper to pan and toss to coat. 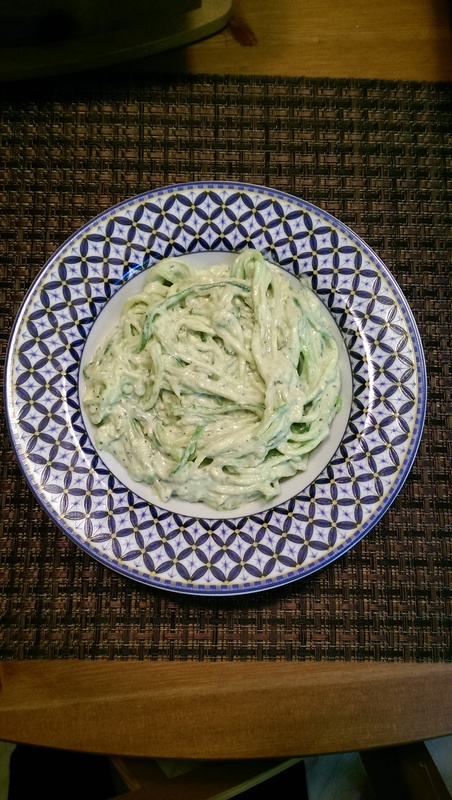 Cook for 5 minutes until noodles have softened, but are still firm and bright green. Remove from heat and set aside. Melt butter in another skillet over medium-low heat. Add garlic and cook for about two minutes until garlic is soft and fragrant, but not browned. Add wine, lemon juice, and zest. Bring to a boil and cook for about 1 minute. Turn heat to medium and add the shrimp, tossing to coat. Cook until heated through (when visibly shrinking and liquid starts to boil again). Remove shrimp with a slotted spoon and set aside. Add flour, salt and pepper (to taste) to the lemon butter sauce and whisk constantly until flour dissolves and sauce thickens. 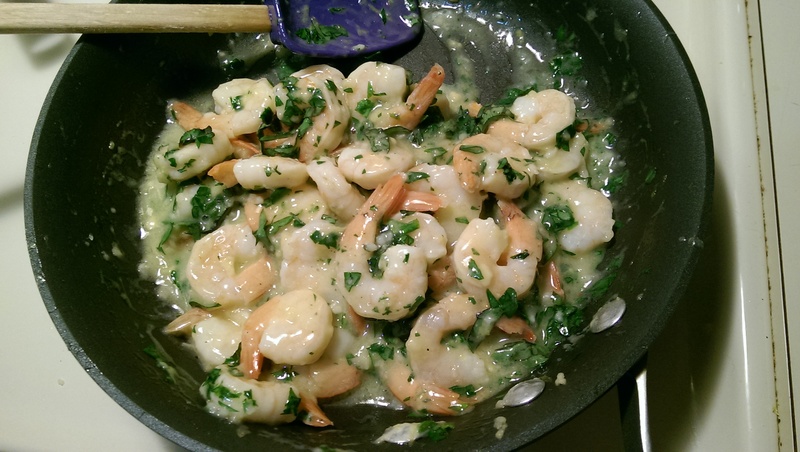 Return shrimp to pan, add fresh herbs, and toss to coat. 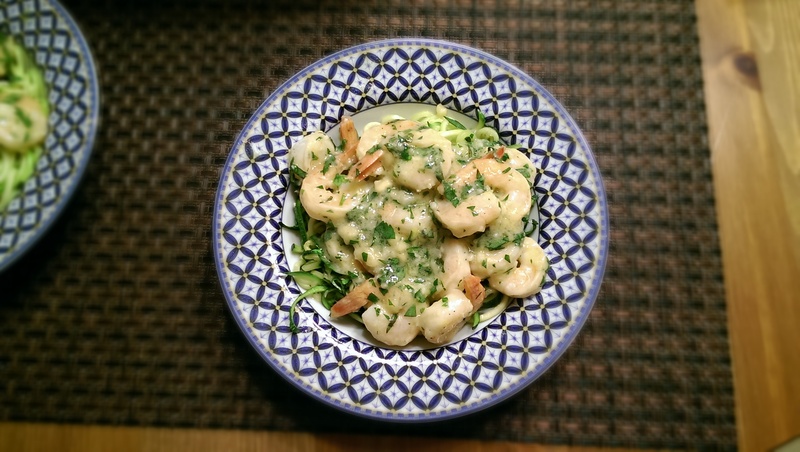 Serve zucchini noddles topped with shrimp, drizzling extra sauce over the top. Enjoy! Categories: budget-friendly, gluten-free, paleo, recipes, Uncategorized | Tags: clean eating, gluten-free, paleo, shrimp, shrimp scampi, zucchini, zucchini noodles | Permalink.